Blue Blue Varies Off Off Normal operation. Blue Blue Flashing blue Off Off A/V Mute is on. Blue Flashing blue Varies Off Off Warming up. Wait for an image to appear. Blue Off Off Off Off Standby or network monitoring and control (when Standby Mode is set to Communication On). Blue Flashing blue Off Off Off Cooling down. All buttons are disabled. Flashing blue Varies Varies Flashing orange Varies High temperature warning. If the temperature gets too high, projection will automatically stop. Off Flashing blue Flashing orange Off Off Internal error. Turn off the projector, unplug it from the electrical outlet, and contact Epson for help. Off Flashing blue Off Orange Off Projector is too hot (overheating) and projection stops. Leave it for about five minutes to cool down. Off Flashing blue Orange Off Off Laser has a problem. Varies Varies Varies Varies Flashing orange It is time to clean the air filter. Off Flashing blue Off Off Orange Low air flow through the projector. Flashing blue Varies Varies Varies Orange Low air flow through the air filter. Off Flashing blue Off Flashing orange Off A fan or sensor has a problem. Turn the projector off, unplug it, and contact Epson for help. 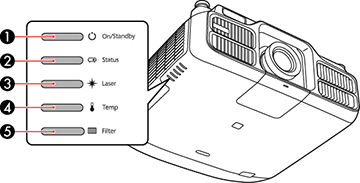 Flashing blue Varies Flashing orange Varies Varies Laser has a problem. Turn the projector off, unplug it, and contact Epson for help. Flashing blue Varies Flashing orange Varies Varies An unsupported lens is attached (Pro L1500U/L1505U). Make sure your lens is supported.